Recommended to: Readers who quick moving stories and a Japanese setting! I'll be straightforward with you and explain that the reason I picked Ink up in the first place was that it was set in Japan. I love Japanese mythology, and I definitely love Fantasy reads. Needless to say, I was really excited to read this book. I couldn't wait to see where Katie Greene's new life in Japan would take me. It was so interesting to watch Katie as she settled into her new life. I can't imagine living in another country, much less one where the language is still new. I felt her reactions to everything were really spot on. In fact, I can't deny that I liked Katie immensely. She was kind, honest, and just sarcastic enough to create some lightheartedness for the story. When Tomo came into the picture, I knew things were headed in a fabulous direction. A boy with a dangerous side, who Katie just can't stop thinking about? Yes, please! Japan was a gorgeous setting for this story. It's really obvious that Amanda Sun did her research on the culture and the mythology laid out between these pages. Katie's new home comes to life on the pages. I could see the cherry blossoms, feel the breeze, and fell in love with the descriptions of her surroundings. If I didn't already love everything about Japan, I know I'd be intrigued after reading this. It was a perfect backdrop for all the dark, menacing events that take place. The absolute only thing that I had a problem with was the slow beginning. Some of Katie's reactions to Tomo were a little over the top, but I was willing to forgive them for the most part. Once everything took off, once I learned what Tomo's dark secret was, I was lost in the story. 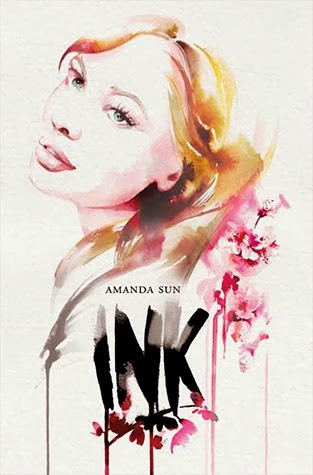 The story is wonderful, the setting is perfect, and I definitely enjoyed reading Ink.